Before anyone else points it out, yes, this is the same Joel McIver who wrote the highly controversial book '100 Greatest Metal Guitarists', my views on which have been made very clear a few posts before this one. This book, however, is a different beast altogether. For many years, deceased musicians have been influences to millions, inspiring whole assembly lines of literature paying glowing tributes to them. Metal, on the other hand, has faced an unfair lack of reverence towards its own departed souls from the rest of the world. Talented greats who probably added a whole new style to mastering their respective crafts have just died deaths ranging from unfortunate to horrifying, without anyone outside of the genre ever looking back on them. Metallica's departed bass player Cliff Burton has been dead since 1986 and it was only in 2009 that Joel McIver released this account of his life, the first of its kind. But in some morbid way, it was definitely worth the wait. 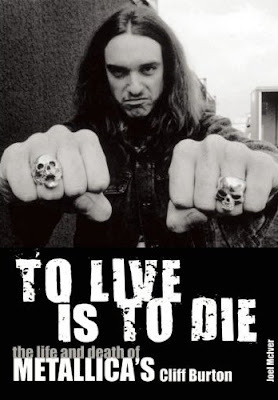 What most metal fans associate Cliff Burton with is the golden age of Metallica. His tenure was the time when Metallica reigned supreme as the gods of thrash metal, always reinventing and enhancing their own craft with each successive release. But the major percentage of fans cannot really figure out why, and this is where this book becomes important. After many months of evidently painstaking research that involved travelling to his home town, speaking with his family, friends and generally the who's-who of metal at that time, Joel McIver's book remodels the metal scene of LA and the San Francisco Bay Area. This was a time when British metal bands were the only word in metal, when there was no internet and hence tape-trading was the way music was heard. The book brings all this to light and then relates how Cliff Burton grew up with the situation back then. The book is full of useful interviews with people closest to Cliff, including his family, his bass instructor John Doherty, music promoters like Harald Omoein and all those musicians associated with the various bands he played for; including, of course, everyone associated with Metallica. It also makes for a very interesting read with interviews from people with more awkward dispositions like Metallica's first bass player Ron McGovney, members of Trauma (the band that Cliff played for before joining Metallica) and Megadeth frontman Dave Mustaine. The book opens Cliff's brilliant mind to its readers, making it clear why Metallica's song-writing was at its peak with his presence in the band. Here was someone extremely level-headed, logical and most importantly, versatile. Cliff's musical influences encompassed almost the entire spectrum of Western music itself, ranging from Western classical to country rock to the New Wave of British Heavy Metal. As a bass player himself, Joel McIver never leaves out accounts of Metallica's music. His explanations of Burton's mastery on each song from each album is worthy of applause. The reason is that he has translated a lot of bass terminology into layman's language and has dissected each song as clearly as possible, making it a nostalgic read for both layman and bass player alike. His description of Cliff's growth as a musician and how it bled onto the rest of Metallica as well is important too. Important because it becomes very apparent why Metallica's reputation as metal musicians started taking a nosedive after Burton's death. His death, in fact, has been a topic of great controversy and another commendable fact about this book is how the author has retold the events in a very investigative format. He has been extremely objective about what happened and who was involved, never accusing anyone. In fact, that has been a hallmark throughout the book. He has presented the facts and left its interpretation to the reader, making sure the reader feels the way he/she wants to and not how McIver want him/her to. In a nutshell, this is an essential book for a lot of people. Everyone who is a fan of Cliff Burton, a fan of Metallica, a fan of thrash metal (or just metal in general) and most importantly, a fan of greatness that was snuffed out unfairly early, should buy this book. If you're close enough to Burton's music, who knows, you might just shed a silent tear as well. I know I did.